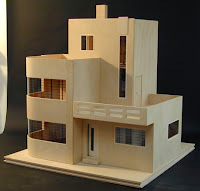 I find this to be an extraordinary art deco dollhouse. The unusual way that it opens (a cam and track system in the base) seems like it should have dramatic theme music. 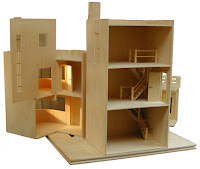 It was an experimental prototype produced by Honeychurch Toys Ltd.--a company based in the UK that made high quality Birch plywood dollhouses for more than 30 years before closing their operation. 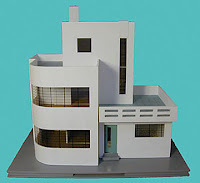 The company had hoped to produce more of these but only made the one pictured here which was sold off. 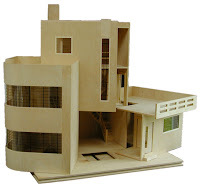 Although Honeychurch has closed its doors, you can still find a few of their collectible dollhouses and other structures via Robin Brookes Design.